There are now more than 17 million cancer survivors in North America and this number is expected to increase to close to 30 million by 2040. This is without doubt a good news story, reflecting an impressive 27 per cent drop in the number of people dying from cancer over the past 25 years. However, it is important to recognize that cancer care does not stop after treatment ends. Although many cancer survivors are able to recover and get back to normal functioning, many others suffer toxic side-effects of treatment. These include fatigue, neurocognitive impairments and psycho-social challenges such as anxiety, depression and changes in relationships. These side-effects can leave survivors disabled. They can interfere with their ability to work, engage socially and carry out simple daily tasks such as preparing meals, shopping, bathing and dressing. Indeed, research has shown that having a medical history of cancer at least doubles an individual's likelihood of poor health and disability. This poses significant and pressing challenges to our health systems. The limited resources for cancer care have traditionally been directed to the treatment of new cancers and reducing mortality. It is time for cancer care to expand the focus and include improving functioning, well-being and recovery. A recent national study conducted by the Canadian Partnership Against Cancer polled more than 13,000 people who had completed cancer treatment. It found 80 per cent of patients reported physical challenges, 70 per cent reported psychosocial challenges and 40 per cent reported practical challenges such as returning to work after treatment ended. Lisa, a busy 56-year-old mother of two college-aged children who worked full-time as an administrator in an office, is one example someone who has experienced these challenges. Lisa was diagnosed with stage II breast cancer after it was detected on a mammogram and confirmed by a biopsy. She had a mastectomy, followed by chemotherapy and radiation therapy. When Lisa finished treatment she was told to come back for a follow-up appointment in three months. Lisa developed fatigue during her treatment and started to have a heavy feeling and some swelling in her arm. She hoped that this would go away once her treatment ended, but two months later she still felt tired and had no energy and the swelling in her arm had increased. She felt pressure to get back to work and she was increasingly feeling socially isolated because she had no energy to get out and see her friends. She started feeling anxious and not sleeping well. But Lisa didn't tell anyone she was suffering. She felt she should be happy she survived. She wondered if this was just normal and to be expected. For people like Lisa who are affected by persistent side-effects of cancer and treatments, rehabilitation can play an important role. 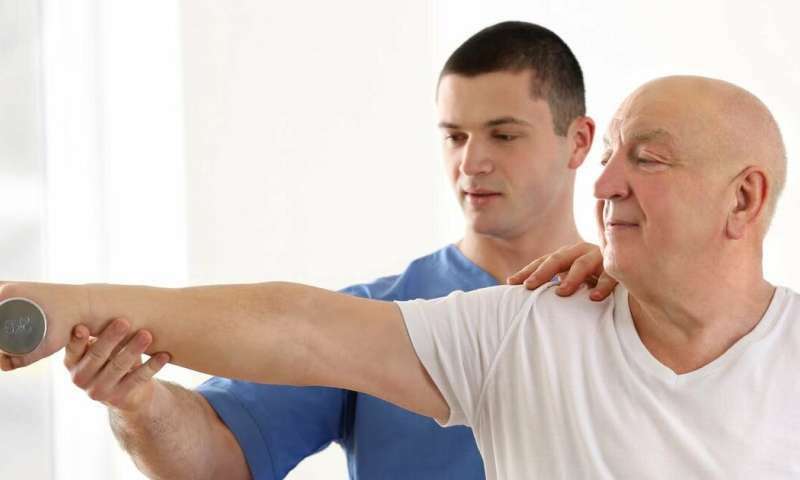 Rehabilitation for cancer survivors is similar to rehabilitation from other conditions (for example after a heart attack or stroke) and there is good evidence demonstrating the benefits of cancer-specific rehabilitation interventions for quality of life and physical functioning. Based on this growing evidence base, there are now consensus‐based guidance statements on rehabilitation. Despite this, there is little to no funding for outpatient rehabilitation for patients after cancer treatment. Integrated comprehensive cancer rehabilitation programs are still the exception rather than the rule across North America. As a result, cancer survivors often feel left on their own to manage the long-term consequences of cancer. As cancer rehabilitation researchers Julie Silver and Laura Gilchrist describe it: "The medical system creates a situation where high-functioning individuals are given life-prolonging treatments and then left to struggle with how to recover from the toxic adverse effects of these therapies." In Lisa's case, at her three month follow-up appointment her oncologist referred her to a lymphedema specialist to help manage the swelling in her arm (on a fee- for-service basis) and recommended that she start exercising to help with the fatigue. This was good advice given the current evidence, but Lisa had no idea how to start and was so tired and distressed that she felt overwhelmed. She also didn't know what exercise to do and if it was safe given her lymphedema. Lisa is not an isolated case. She would have greatly benefited from a multidisciplinary rehabilitation team that could have helped her begin a safe and progressive exercise program, address her mood and sleep issues and make a successful return to work plan. Some emerging rehabilitation programs are leading the way and offering examples of what could be standard of care for cancer survivors. At the Princess Margaret Cancer Centre in Toronto, patients who have identified impairments are referred to the Cancer Rehabilitation and Survivorship Program which offers a lymphedema service along with one-on-one consults with the rehab team to address issues such as return to work, physical function and neurocognitive changes. The program also offers an eight-week group rehabilitation program which combines exercise and education and is soon to launch an online program for patients to access from home. The demand for this program has grown by close to 30 per cent each year, yet the funding for this program comes from the Princess Margaret Cancer Foundation rather than health-care funding. Patients from outside of Princess Margaret do not have access to these services and often pay out of pocket for access to rehabilitation specialist who may not have specific cancer training. Cancer rehabilitation should not be viewed as a frill add-on but rather an essential part of cancer care. The increasing number of cancer survivors, along with the growing evidence documenting the lasting effects of treatments, serves as an urgent call to action —to invest in the recovery and well-being of cancer survivors and help them get back to life after cancer.